Buy one Sarah and one PJ – or – two PJ – or – two Sarah. 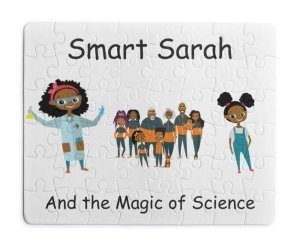 Puzzles about Smart Sarah and Perceptive PJ from the Technology Expresso STEM/STEAM books Smart Sarah and the Magic of Science, and Perceptive PJ and the Making of a Mathlete. Challenge and interesting puzzles that make excellent gifts for anyone who liked the stories.